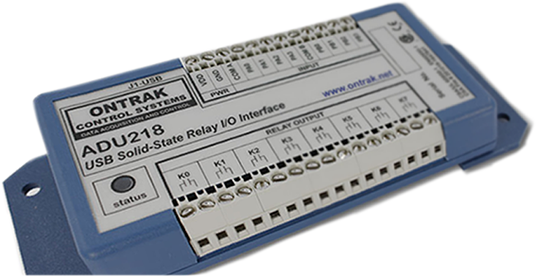 The ADR interfaces (RS232) allow data acquisition and control using ASCII commands sent and recieved via a serial port. No drivers are required for any programming language, making them ideal for custom applications. Tutorials on programming the ADR interfaces using popular programming languages can be accessed using links below. Start by first viewing the ADR Interface commands, a listing of ASCII strings, and then select the programming language of your choice to view examples. Your language of choice may not be listed but almost all languages allow control via serial ports. Check your programmers reference guide under "RS232", "Com Ports" or "serial ports". ADRCOM RS232 Terminal Emulation Software, allows users to send and recieve ASCII commands via an RS232 port. ADUHIDTest USB Terminal Emulation Software allows users to send and recieve ASCII commands via a USB port. These two programs should be the starting point for first time users of ADR and ADU interfaces. If you are a first time user or are having problems with a higher level language, use ADRCOM or ADUHIDTest to verify hardware connection and then return to the desired programming language. The complete SDK is available here and contains Visual Basic, Visual C++, VB, VB.Net, C#, Java, and Borland C examples.